Okay, I’m happy to hold my hand up and admit that this topic was my suggestion. My daughter is about to start teaching in China, and her classes will contain around 40 students each. Not able to give her advice from my own experience, I turned to the experts who take part in #ELTchat on twitter every Wednesday- and they came up trumps, as usual . The chat was made up of teachers from around the world- some with experience of teaching large classes, ready to impart their knowledge. Others were there to gain information, or even just to commiserate with / take their hats off to those who taught large groups. @Shaunwilden started the ball rolling by asking how these classes differ, apart from size. At this point the numbers began to appear: people taught classes of 25, 27, 32, 38 and 50. Classroom management appeared to be one answer to his question. Another was the fact that these classes often contain mixed abilities, language levels, motivation, needs, interests, and goals. Certainly, many classes may present as mixed ability, but when working with 40 students it might prove difficult to measure effectiveness. Does language acquisition actually take place in a large class? How do you make opportunities for students to speak? @SophiaMav and @AnitaJankovic suggested splitting the students into smaller groups. But it isn’t easy to monitor so many groups. Even spotting mistakes needs the teacher to be aware of what is happening in the class. @theteacherjames suggested that giving worthwhile feedback would be a challenge, and Shaun thought that monitoring wouldn’t really be much use. Using the more able students as TAs was apopular idea, as was the idea of splitting the group so that the teacher could concentrate on the weaker students. @MarjorieRosenberg suggested that large classes can be livelier and more rewarding than reticent smaller classes. @shaznosel asked how it would be possible to ensure that the weaker students were engaged and producing language. James thought that large classes gave reluctant students a place to hide.It was suggested that a group should only have 3 members to avoid any of the students coasting. Sophia agreed that it was important to find active roles for students to avoid them ‘lurking’. @CotterHUE thought that teachers were not reassured that they could reach all students and help with their goals in large classes. @timjteacher suggested alternate assignments to focus on different student needs. Again you have the problem of monitoring and giving feedback in an effective way. @naomishema uses edmodo to help her students feel ‘noticed’. Her students have the perception that they are being given individual attention. The asynchronous communication ensures that everyone has time to connect with the teacher. @joannacre suggested study groups with students recording themselves for homework. Shaun thought that phones would be available so the teacher could utilise the text function. How does the teacher cope with 40-ish names? Naomi found remembering names challenging. Anita found that seating arrangements were helpful. @prese1 used a register with a photo next to each name. At the very least name tags would seem to be necessary! How can the needs of ALL the students be met? Ask students to draw up class rules at the start. Turn it into a contract so that they know what they are working towards. Concentrating on the weaker students is alright up to a point. The more confident learners also need the teacher’s attention or they could become bored and disruptive. The teacher needs to know the class well enough to know who is weak and who is just underperforming. @louisalix68 told us about a school where she worked with large classes. Each class had 2 teachers so each could concentrate where needed. Naomi said that her breaks were always taken up by the weaker students. Challenges are needed for all students, so providing material that lets learners progress at their own pace is key, but difficult for a teacher to prepare and stay on top of without putting in a lot of time in the planning and marking stages. @toulasklavou thought that large classes are not ideal for learning unless the teacher is skilful and the students motivated. Should you pair weaker students with stronger ones? It was suggested that the weaker ones could feel intimidated, so the pairing of complete opposites wasn’t very practical. Is the situation easier with a class of teenagers or adults? Tonight’s participants thought that teaching adults might be better, as paying their own fees would motivate. They could also be more demanding as they are looking for good returns for their money. Teens could be moredifficult to manage and are less tolerant of the differences in likes/dislikes of others. Finding topics to engage is more of a challenge. If the teacher has to be concerned with discipline issues it is harder to get them to learn. Naomi suggested having an answer key on the teacher’s desk for a group using worksheets. Students send a representative of the group to check the answers or look at hints. As there are always fast finishers it keeps everyone engaged and busy- great peer work in action! @vmorgana gave us a useful link Large Teenage Classes: some strategies to enjoy the lesson! http://t.co/ocSnhO7T via@barbsaka in Japan. @CotterHue offered an idea for students to work on a series of questions with a partner and then add follow up questions. @lewiswaitt includes his students in the preparation of resources for class and limits the amount of pre-made material. @designerlessons collaboration on projects. This would engage all the students but might be difficult to monitor effectively. For some learners using drama or humour might work, but it wouldn’t suit everyone. What about the Class environment? 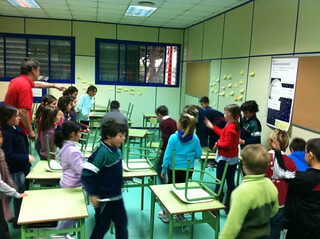 There was a discussion about the nature of the chairs and/or desks in the classroom. Being able to physically move the tables can turn a large class into small manageable units. Some of tonight’s contributors worked in places where this was not an option; chairs were in serried rows, bolted to the floor, or even had no appreciable space to set books out on. Some of the options were unsuitable for left-handed learners! Students being taught in a lecture hall have very limited options for collaboration in groups unless the teacher is creative J Anita explained that the online portion of her classes was essential. Did the setting also mean that some teachers lecture, or just go through the motions when faced with a large class in a unprepossessing environment. What would you do for a first lesson with a large class? Provide a couple of packs of cards. Deal one out to each student. The number on the card is the number of facts about themselves that the student has to share. Rory’s dice – lots of them so they can be used in a large group- students can write up the story. And don’t forget to check out the links above- some excellent ideas there!